TL;DR - Learn how you can easily run Kong on Microsoft Azure and configure it to serve traffic from Open Brewery DB secured with API key authentication. Recently I wrote about Kong, an open-source API gateway that is gaining a lot of momentum in the API world. Today, I will show you how easy it is to get a single-node Kong cluster up and running on Microsoft Azure with Azure Container Instances & Azure Database for PostgreSQL. Before we can start running our Kong cluster we need to provide a data store for it first. As of today, Kong allows you to use Cassandra or PostgreSQL. One option would be to spin up VMs or deploy them as containers and host them ourselves, but I'm more of a "Microsoft will handle that for me" type of guy. I try to avoid having to maintain infrastructure while I don't need to. That's why we can use these two PaaS offerings in Azure - Azure Database for PostgreSQL or Azure Cosmos Db. They both give you a database without having to worry about running it, we can just use it and pay for the service tier that we want. Unfortunately, Kong does not support using Azure Cosmos Db as a data store due to some missing features in the Cassandra API. If you want to use this, head over and give a :+1:! Now that our data store is provisioned we are ready to roll! The only thing we need to do first is to run the initial database migrations! In order to do that, we need to run an instance of the Kong image against our DB as a one-off job. One possibility to achieve this is to run it locally, but that would be boring and less efficient. Next, we can start our single-node cluster on Azure as well. This can basically be any container platform on Azure - Be it Azure Service Fabric Mesh, Azure Container Instances, Azure Kubernetes Service or Azure Web Apps for Containers. This will expose a Kong instance on kong-gateway.westeurope.azurecontainer.io serving the proxy on port 8000 (HTTP) & 8443 (HTTPS), but also management API on 8001 (HTTP) & 8444 (HTTPS). Careful - You should make sure nobody can access your Admin API on the default ports as this has security implications. We're ready to roll! We now have a Kong gateway running in Microsoft Azure ready to be consumed. Now that our proxy is ready we will configure it to serve data from the Open Brewery DB API to our customers. In order to do that, we will create a breweries service which can be served for all requests to apis.breweries.com. Once the service is there, we can route traffic to it via a route. This will make sure that the consumer his request ends up with the correct service. Note that in this case we are telling it to use the hosts header as a routing mechanism to determine the match, but you can also use routing via uri path or method as documented here. The world loves beer so there is a ton of them so I redacted the response but you get the idea! As you might have noticed, the response includes not only the standard HTTP headers but also the ones from api.openbrewerydb.org and Kong giving more information. This is always a hard choice to make - Should we include them or remove them. I'm always leaning towards reducing the responses to what is required as we don't want to leak information about our dependencies, but it's all configurable anyway. Time to make our API a bit more advanced! We have a Kong gateway setup that will serve traffic from Open Brewery DB API to everybody who's interested - Great! Since we want to monetize our API, we'd like to enforce consumers to authenticate first and return a correlation id which can be used to create a support ticket. Unfortunately, we cannot change the upstream API to do this but luckily Kong provides the capability to deploy plugins. These are a great way to extend existing systems by deploying logic on the gateway. As mentioned in my previous article, plugins can be applied on a variety of levels but today we will enforce them on all our services. ❯  curl -i -X POST --url http://kong-gateway.westeurope.azurecontainer.io:8001/plugins/ --data "name=correlation-id"  --data "config.header_name=X-Request-ID" --data "config.generator=uuid#counter" --data "config.echo_downstream=true"
As you can see, the only thing we need to do is specify which plugin we want to install, and how it should be configured. Kong comes with a variety of security plugins to enforce authentication & handle authorization. Once the plugin is installed, all requests are forced to specify an API key or will receive an HTTP 401 Unauthorized. In order to have an API key, we need to create a consumer for the user and generate a key for him. ❯  curl -i -X POST http://kong-gateway.westeurope.azurecontainer.io:8001/consumers/ --data "username=tom"
It's always good to keep track of what plugins are installed, certainly if they are applied on different levels. In a matter of minutes, we were able to spin up a single-node Kong cluster that is running on Microsoft Azure and serving traffic from www.openbrewerydb.org! 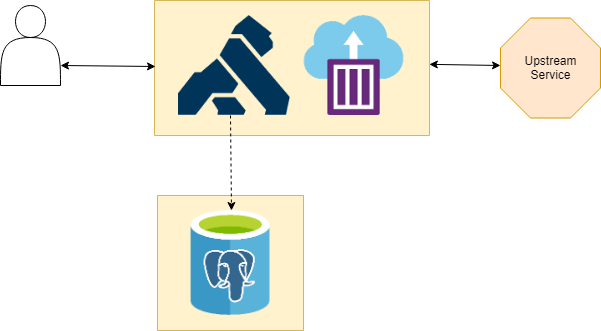 By using Azure Database for PostgreSQL we could easily spin up a PostgreSQL database to store the metadata for our gateway that is running on Azure Container Instances. We've also seen how easy it is to create a service, route consumer traffic to it and make it more robust with plugins. It's good to note that Microsoft Azure is not an officially supported cloud runtime by Kong (yet), but you can find all Azure related docs on Kong Hub - Let me know if you're missing something! Although this example is not rocket science I think it shows how easy it is to use Kong and get started quickly, however, I've found that the documentation is very API centric and sometimes lacks the high-level picture of how everything ties together - But that can be improved! Later on, we'll have a look at how Kong & Azure API Management relates to each other and where they both shine.